Getting prepared for battle is no easy thing. It takes time, preparation, and knowledge of your armor and tools. 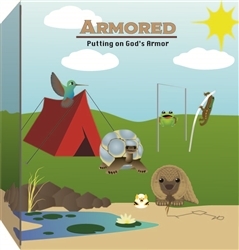 Join us at the Roman Army's Encampment to begin training and learning how to put on the full Armor of God with a few of our unique animal friends who teach us a thing or two about defense strategies. At the Encampment clue solving skills are taught through Guess the Word and Animal Trivia, examples of defense strategies are given in Animal Object Lessons, and a run down of your protection is explained at the Armory. The Strategy Meeting is where specific defense examples and strategies are developed through Bible Stories of Bravery, Prayer, and meeting in a Team Huddle to further discuss daily strategies to use on the battlefield. Finally, before a soldier is prepared to go out, they must practice at the Training Ground. At the Training Ground tools are given and practiced that help prepare each soldier for battle. Each soldier is taught Memory Verses to have at the ready, create survival crafts, gain energy through snack, and practice all their skills in an interactive game. As they leave the Encampment, a Family Summons is given to each soldier to introduce their families to the various training techniques and give ideas for further training at home. Belt of Truth - We tell other's God's truth when we follow it. Breastplate of Righteousness - The Breastplate of Righteousness guards our spiritual heart. Feet Fitted with Readiness - A Relationship with Jesus Brings us peace. Shield of Faith - Use the Shield of Faith to protect us from Satan's attacks. Sword of the Spirit - Use the Sword of the Spirit to fight against Satan's attacks.